 Articles about art appreciation, art instruction, art resources, the principles of good design and much more. New articles are added everyday! If you are looking for particular article or subject, trying looking for it in the Article Index. 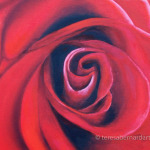 Are you looking for some oil paintings to adorn the walls in your home or corporate office? Before you head out the door to find that fabulous canvas art to accent your decor, there are a few things you will need to consider first. Tip #1. Size — The first thing that needs to be considered is the size of the space where your painting will be displayed. This can be done by taking measurements of the wall space or area. 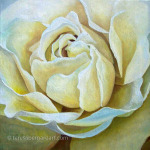 If it is a large area you will want a larger size painting, a smaller area requires a smaller one. This is an important step that should not be neglected. If you purchase a painting and it doesn’t fit in the space you will be unhappy with your selection. Too small and the painting look lost and out of place in the all that empty wall space. Too large and the painting will appear crowded in the space or won’t even fit the space at all. As such it is a good idea to measure your wall space before even setting out to look for a painting to buy. Tip #2. Color — The color scheme in your home or office needs to be considered as well. Your painting should complement the colors in the room unless you are going for harsh contrasts. You might not be happy if the colors in your newly acquired painting doesn’t match your sofa but clashes with it instead. Also keep in mind that colors play an important role in setting moods. Choose calming colors, such as light blues and greens for bedrooms and areas where relaxation is important or deep. Bold colors work well in rooms and spaces where conversation and entertainment take place. Tip #3. Style — The next thing to consider is the style of your decor. Is it contemporary, traditional, or a combination of both? Why not mix and match? Not everything in your home needs to match or be the same. Think about mixing up patterns, textures and even eras. If your home is an older home with traditional decor, a piece of modern art just might look great! 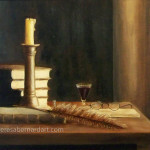 And the same goes for a vintage style painting in a contemporary setting. Remember to have fun and at the end of the day, as long as you love it that’s all that matters. Tip #4. 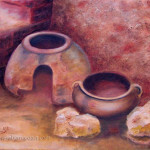 Subject — Next, think about what types of subject matter interest you in a painting. 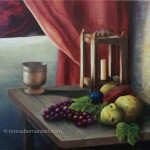 Still life, landscapes, seascapes, or wildlife? Paintings of faraway places or local hangouts? People perhaps. Art can be great conversation starters between you and visitors. You can choose a painting that is different or makes a bold statement. It can be fun to see what type of reaction your family and visitors will have upon seeing the painting for the first time. Tip #5. Purpose — Make sure you buy something you love. Take your time to decide what it is you like in a piece of art. What type of paintings are you naturally drawn to? Is it a particular style, artist or period? Browsing through galleries, museums, art books and websites will help you to decide. This will be necessary to know if you are considering on buying art as an investment. Keep in mind paintings will take a long to go up in value, so it is best to buy a painting because you love it rather than waiting for it be worth a lot of money someday. Once you have something in mind you will be able to find just the right oil painting to suit your needs and bring years of enjoyment to you, your family and friends. For additional information on this subject see article titled Some Things To Consider When Buying Oil Paintings For Your Home. Mountains have always been appreciated for their majesty. Whether it is to paint them, climb them, hike them or simply gaze upon them, people are drawn to a mountain landscape. Their visual and inspirational splendor makes mountain scenes a very popular feature for artists to include in their landscape paintings. Mountains are also popular with art buyers from all over the world. So much so that many top art galleries prefer to display oil paintings of landscapes featuring some very popular mountain ranges. Or you might just want to design a mountain range from your own imagination. There is no hard and fast rule that says it has to be an actual mountain that exists somewhere on earth. You could even paint a mountain range that is on some distant moon or planet. For example Olympus Mons, the highest mountain on Mars. Of course you would have to rely on reference photos for something like this. See Land Rover Tracks of Mars as an example of an off world landscape with a mountain range made up from the artist’s imagination. 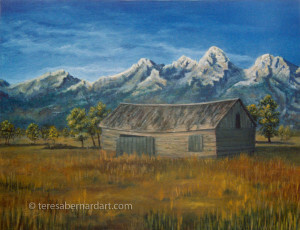 Tip #1 — Pay special attention to the profile of the mountain or mountain range you are painting. Especially if it is one that is a recognizable landmark. Every mountain has a unique feature and specific shape to it. 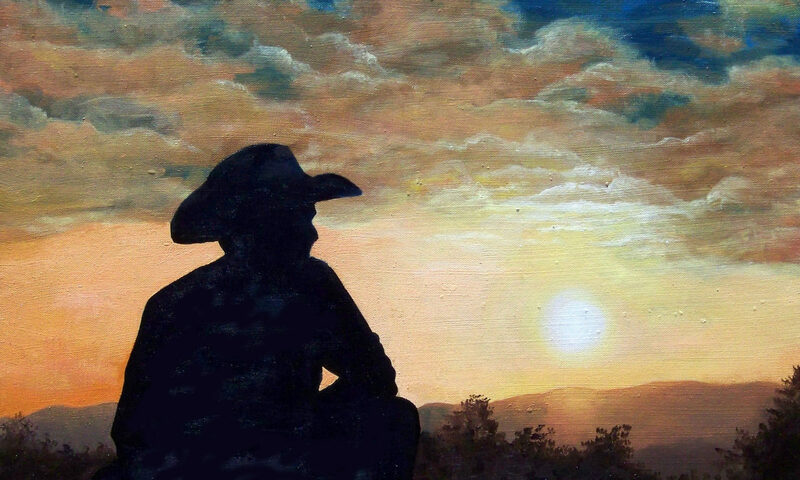 Those who view your painting will recognize the scenery and will want to buy your painting as a result because it has some special meaning for them. Tip #2 — As you are sketching the mountain onto your canvas, consider making it the dominating feature to show off its majesty. This can easily be done by giving it the most space on the real estate of your canvas surface. This will entail having to reduce the size of the surrounding supporting elements such as the trees, lakes, sky, grass, wildlife, etc. Tip #3 — As the distance between you and the mountain range increases, everything gets lighter in value. As the landscape hits the horizon line the color is less saturated as it disappears into the distance and becomes closer in value to the sky color. Tip #4 — When painting mountains that are off in a distance be sure to employ the use of atmospheric or aerial perspective to create a sense of depth. A faraway mountain range will usually appear lighter, hazier and bluer as it gets further away. Tip #5 — The further away a mountain is, the less detail it will have. That means crevasses in the mountain side will become less defined and you probably will not see any trees either. Tip #6 — Tone is very important when painting mountains. The mountain will be a pale tone near the top and will have a deeper tone at its base. This will help to give the mountain depth. Tip #7 — As a general rule try to arrange the shape of your mountains so they slope into the picture and not out. This will help direct the viewers eye into the painting as they follow the outline of the mountain. Tips #8 — Try to blur the outline of the furthest mountain into the sky. You can blur it more than you would initially think as the viewer will “create” the shape of the mountain in their mind’s eye. Tips #9 — To create a sense of depth in your landscape painting, paint your mountain ranges in layers going from those that are the furthest away to those that are the closest. The mountains that are furthest away should be painted in first. They should be the lightest, haziest and possess the least amount of detail. Next add in another range of mountains closer to you. These would be placed in front of the first mountain range. They would be more intense in color and have a more details than the previous range, but not as much as the next range to be added. Continue doing this until you have all your mountains in place. By layering various additional elements in your paintings foreground will help to give distance and perspective to the mountain range in the background. Tips #10 — Not all mountains resemble inverted cones, many are lopsided, pyramidal, or even flat on top. Some have snow caps, while others do not. Add interest to your mountains by varying its contour, texture and color. 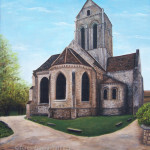 (1) They will solicit business owners to display their artwork sometimes offering a commission on every painting sold. Such businesses can include, but are not limited to cafés, banks and art galleries. (2) Still other ways are to attend art fairs and festivals, and art exhibitions where they can display and sell their paintings. This method requires an investment in displays, tables, and canopies, etc., and also requires the artist to be onsite for the duration of the event. (3) However, there is one venue that is often overlooked by artists and that is the Internet. It is a smart artist who is really serious about selling their artwork to put up a website for showcasing their creations. However it doesn’t stop there, now they must get visitors to their website. The more visitors, the greater potential there is for selling their paintings. 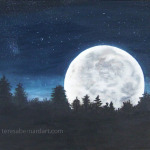 If you want to market your space paintings online then are a few things you will need. The most important thing the artist will need is a website. This can be developed using a do-it-yourself template or you can hire a web designer to create one for you. Many graphic web designers are also artists themselves and can build a website that you would be very proud to display your cosmic works of art on. A PayPal account or some other kind of merchant account so you can accept payments over the Internet. These funds can be deposited directly into your bank accounts. PayPal offers the ability to provide the artist with some “buy now” buttons and will process all transactions for you. They do charge a small fee to do this, however. The upside of this is you can offer your customer a safe and secure method to purchase your paintings without having to have a shopping cart on your website. A sound SEO strategy is key to getting traffic to your site. SEO is an acronym for “search engine optimization”. Getting traffic to your site is of utmost importance because every visitor to your site is a potential customer. Without traffic you will not make any sales online. There is one other method that needs to be considered and that is to list your space paintings on sites like “eBay”, “Etsy”, and “FineArtAmerica”, to name but a few. These sites will charge a fee when you sell one of your paintings, but it might be a better way to go if you don’t want to manage a website yourself. 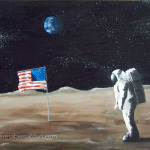 For more information about where to market your space paintings online see articles listed below. Finally, selling your space art paintings online can be a very gratifying and lucrative experience for you. It’s definitely worth your time and effort to use this method. So you want to learn how to paint space paintings. Learning how to draw and paint planets, moons and landscapes of alien worlds can be a lot of fun. Space art is such a fun genre of painting and, indeed, a favorite one for many artists. Some artists specialize in just this one genre of art, preferring to leave behind the boundaries of Earth for some otherworldly landscapes. They have become recognized as “space artists” or “astronomical artists”. As you can imagine, astronomical artists have a bit of a challenge when it comes to reference material for their space paintings. After all it isn’t like they can go out to some off world location to paint. They must rely on photos supplied from various sources or paint from pure imagination. A few pull out their telescopes or stare up into the night sky for inspiration. NASA can be a source for some reference photos that can be used to create space art from. Various other agencies, such as the Jet Propulsion Laboratory, Astronomy Magazine, or National Geographic, among others. (However, you must be careful not to violate copyright if using images from magazines.) All of these can be a source of reference photos from which to compose your space art paintings from. “Googling” keywords such as NASA photos, space flight photos, etc. can render a large selection to choose from. Still many space artists choose to travel all around the world looking for suitable typography to do their preliminary sketch work from for their space paintings. So much so, they become students of geography and most notably any type of land formation that can be transformed into an off world landscape on some distant planet. They are guided by science and their imaginations to compose striking moonscapes or other landscapes of alien worlds. Some of the most beautiful space paintings ever seen had their beginnings using a popular software program called “Photoshop”. 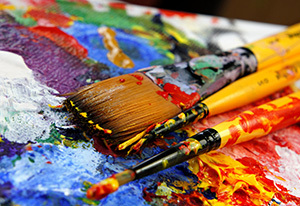 This computer program has the ability to assist artists in composing their paintings. 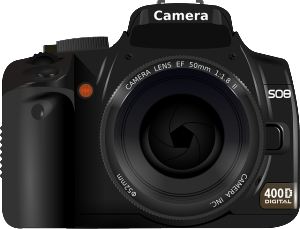 Many artists frequently use this software program to compose their paintings. They can easily do this because the program allows them to move elements in a photo around, remove other distracting parts and even combine several photos into one to see what it will look like before transferring the composition to canvas. By composing your painting this way, it will allow you to work out problematic areas of your painting before you even put brush to canvas. In composing a composition for space art, the artist can take the space shuttle from a NASA photo and combine it with an image of a distant planet taken from a photo and include some bizarre rock formations from yet another photo. Add a black sky sprinkle it with stars, space gas and other space debris. You now have the makings for a very exciting space painting. If you are interested in creating space paintings there are certain elements that you might want to include in your painting to make it qualify as space art. Such things as nebula, stars of course, perhaps a moon, a planet, and maybe even some space dust. These would make a very nice subject matter for space art. Another painting might have the same, but a few additional elements you might consider adding to you composition is a space craft of some sort or even a distant sun. Rugged alien landscapes make great space art too, especially if you include a recognizable planet like Saturn or Jupiter in the dark sky. Alien landscapes could include a vast horizon of sharp mountain formations rising to meet the sky. Pot holes created by meteors and meteorites hitting the surface are a great feature that makes the surface look more alien too. Frozen planetoids can be the subject of your painting. The possibilities are simply endless since you are only limited by your imagination. If you want to be an astronomical artist, you will need some supplies to get yourself started. The supplies you will need is canvas, either board or stretched, tubes of oil or acrylic paint, an assortment of brushes, and some medium. For more information about what art supplies you need, see article titled Complete List of Art Supplies for The Beginning Oil Painter. This article is the final installment of a three part discussion on artist paint brushes. As a recap, in part one brush anatomy and bristle types were discussed. In part two we looked at brush shapes and sizes. In part three the various brush manufacturers and brush care will be covered. 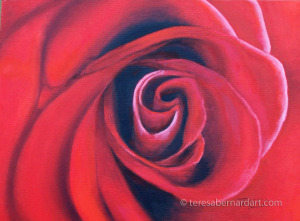 An artist’s single most important tool in oil painting is the paintbrush. It is the main piece of equipment used to apply paint to canvas. Art brushes come in a wide variety of types, sizes and shapes. Knowing all you can about the different types of brushes available and how they are used, will allow you to choose the right one for each stage of your canvas painting. 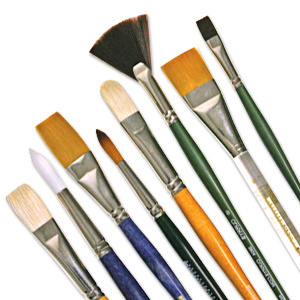 Oil painting brushes are made by a variety of manufacturers from around the world. A few of the more popular brands are da Vinci, Winsor & Newton, Silver Brush Limited, Raphael Paris Classic and the Robert Simmons line of brushes. These brands are the best known and most used high quality brand name of brushes. They will always be known for the quality of the brush as well as their longevity and ease of use. Some artists are faithful to just one or two particular brands and will not use anything else. Whereas, other artists like to have an assortment of different brands available depending on their needs at the time. The only way to know which brand you will like best is by using the brushes yourself. Some name brands will be more expensive than others, however, don’t let that be what you base your final purchasing decision on. With proper care the more expensive brushes will out last the lesser made and priced brands. It makes no sense to invest in quality art brushes if you are not going to take proper care of them. 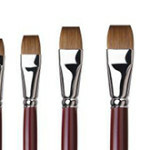 All art brushes require a thorough cleaning at the end of each painting session. Let me repeat, never store your brush until it is completely cleaned. Never leave your brush standing head down in a solvent for any length of time. This can cause the brush to lose its shape. After cleaning, a brush should be hung head-down or laid flat to dry. This allows moisture to drain out of the ferrule and hairs. If you allow your brush to dry standing up, the cleaner and paint residue can drain towards the ferrule, which can weaken the glue that holds the hairs to the handle. In addition it can also cause a buildup of paint residue in the ferrule. In time, this will also cause the brush to become misshaped. When a brush looses its shape, it is then worthless. As a final step in caring for your paintbrushes, you will need to remove the solvent from the head by using a mild “degreaser”, like dish soap, and warm water. This helps to keep the hairs soft and undamaged. One final word – always keep in mind that your art brushes are expensive, if you take good care of them they will last a long, long time. This article is continued from part one where brush anatomy and bristle type was covered. In part two, brush shapes and sizes will be discussed. Art brushes come in four standard shapes for oil painters and are called round, flat, filbert and bright. The names refer to the shape of the end of the hairs on the brushes and the different shapes determine the nature of the stroke that it will make. Therefore, it is important to select the proper brushes for specific needs. There are also a few other brush shapes that are used for specialized functions like blending which will be talked about afterward. A flat is a brush with hairs that are long and flat on the end, much like the head of a screwdriver. From the side it is narrow. Flat brushes have a lot of spring to them and can hold a lot of paint. You can use these brushes for broad sweeping broad strokes or you can turn the brush on its edge to create fine lines. With a little twist, you can even create a triangular stroke. The flat brush is also good for when you are blocking in large areas and for early stages of a painting. These brushes are perfect for quickly and evenly applying large amounts of paint to the canvas surface. The filbert brush is an almond-shaped brush with a thick, flat ferrule and hairs that are medium to long in length. It is similar to the flat brush except the edge of the brush hairs come to a rounded shape. The strokes are somewhere between a flat and round brush. Filberts create a softer more rounded stroke because of their shape and are perfect for painting flower petals and leaves. Round brushes are most often sable hair and get their name from their round ferrule. Their tip is shaped like a bullet which comes to a blunt point or sometimes it can be pointed. They are designed for more controlled brush strokes. Round brushes make a softer rounded stroke and are not suited for creating hard straight edges. They hold a nice amount of paint and are great for making thin or thick lines. 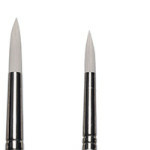 Round brushes are also good for washes, fills, fine detail work and creating long lines. Bright brushes are similar in shape to flat brushes but the hairs are much shorter. They make short controlled strokes and tend to put paint on thickly. Brights are good for driving paint into the weave of a canvas, however if worked too hard, they will actually remove as much paint as they apply. Depending on how you manipulate the brush, brights can create broad and bold brush strokes, sharp edged thin lines or smooth sweeping layers of paint. A bright is the ideal brush for painting landscapes and flowers. The last paintbrushes that fall under this category are called blending brushes. While these type art brushes are not essential like the first four types listed above, they are good to have on hand for smoothing out brushstrokes and for spreading and blending colors smoothly. Blending brushes are very soft and are not used for applying paint. They are made to gently stroke the wet paint that you have already applied to canvas to take out brushstrokes and for blending paint. These art brushes are usually the most expensive art brushes in your paintbox so you will want to take good care of them to make them last a long time. 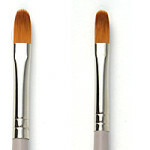 For more information about different brush shapes see article titled Types of Artist Brushes for Oil Painting. The size of your canvas. The larger your canvas, the larger your brush will need to be and the smaller your canvas, the smaller your brushes. The particular area of the painting you are working in. For example, you would use a large brush to apply paint to larger areas of your painting such as the background (like the sky) and smaller brushes for the detail work (like individual leaves on a tree). After you have considered your brush size, the next thing to think about is the handle length. Art brushes are either “long-handled” or “short-handled.” There is no universal standard for handle length. Long-handled brushes usually tend to be around 9 inches or longer and short-handled brushes are generally 6 inches or shorter in length. The handle length was developed ages ago and depended upon the brush use. Oil painters usually stand away from the canvas which requires a longer handle on their brushes, whereas, a water colorist sits and paints much closer to their canvases and do not need the longer handle. Your larger brushes will most likely have the longer handles since they are used are for larger areas of the canvas and smaller brushes will have slightly shorter handles since these are used most for detail work where the artist would need to move in closer to the canvas. A paintbrush’s anatomy is made up of three basic parts. These are the head, the ferrule and the handle. It isn’t necessary to know this to create a beautiful painting, however, by knowing the different parts you will be familiar with various art terms when you hear them. Head — The hairs or bristles of the brush. The hairs are made from either natural or synthetic fibers and is what an artist uses to apply and push paint around on the canvas. The head has three parts too. The very tip of the head is called the toe. The fattest part of the head is called the belly and the point where the head meets the ferrule is called the heel. Ferrule — The metal cylinder that attaches the head on to the handle and helps hold the hairs in shape. High quality ferrules won’t rust or come loose. Handle — The long stem of the brush that is held when in use. It’s generally made of wood or plastic. The length of the handle can vary. A quality brush will balance on your finger regardless of the size. For additional information about the parts of a brush, see article titled Anatomy of The Artist Paint Brush. Artist’s paintbrushes come in a variety of types. Knowing what those types are is beneficial in knowing which brush to use to achieve the effect you desire in your paintings. There are two main types of hairs in paintbrushes – bristle and sable. There is one other type – synthetic, however that one will be talked about last. Bristle brushes are made from ox or hog’s hair and are usually light in color and have a lot of bounce. The ends of the bristle hairs don’t come to a point, but has two or three V-shaped splits called “flags.” This makes them capable of holding a good amount of paint which is beneficial since these brushes are mostly used when you are applying paint to the major areas of your canvas. After repeated use, the “flags” will become stained by darker pigments, however, this will not adversely effect the brush in any way. In addition, because the individual hairs of the bristle brush are hard or stiff to the touch, they will leave small grooves in the paint. These grooves will remain in the paint until they are smoothed out with a sable hair brush. Sable hair brushes are soft painting brushes made with hair that comes from animals such as sable, squirrel, marten or mongoose. They are springy and silky to the touch with each strand converging to a fine point. 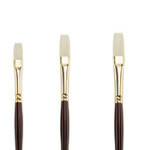 Sable brushes are great for blending, glazing and making soft, less-defined brushstrokes. When compared to a bristle brush, you will notice their hairs are softer and much more delicate. In addition, sable brushes will not leave tiny grooves in your paint. They are capable of smoothing out the brushstrokes left by other type brushes and will give your painting a smoother, softer look when you don’t want your brushstrokes to show. Artists prefer using them for more delicate applications of paint and finer detailed work. Sable brushes are the most expensive and will require more care than all of your art brushes. The final type of art paintbrushes are called synthetic brushes. They are not made from animal hairs, but are products from man-made materials of either nylon or polyester filaments. Synthetic brushes range from soft to stiff hairs. They can be tapered, tipped, flagged, abraded or etched to increase their paint carrying ability. They are more affordable than natural brushes made from animal hair, however, they are not quite as good. The hairs of these type brushes tend to stick together when they get wet and synthetic brushes are also prone to wear out faster and are harder to work with. The individual strands often spread out in all directions and fall out and can become a permanent part of your oil painting. However, there are some advantages to synthetic brushes. They are less prone to being damaged by solvents, insects or caustic paints. They are also easier to clean than natural hair brushes because the filaments won’t trap paint like natural hairs will. For additional information about the different types of brush see article titled Types of Bristles for Oil Painting Brushes.